We’ve all heard of Logitech somewhere – the Swiss tech & hardware provider which just happens to be one of the leaders in the technological market. They’ve made numerous high-quality headphones, accessories, and gadgets, and it’s safe to say that whoever went with their products ended up happy, to say the least. Today we’re pitting G230 versus the later, improved model – G430. Even though we could safely deduce that G430 is better than its previous version, going deeper into details will allow us to understand the difference in value between the “old” and the “new”. Basically, the G230 is a high-quality gaming headphone set which features a noise-canceling microphone, onboard sound controls, and sleek cloth earpads. This model belongs to the lower bracket of the “medium” price point category, and most gamers refer to it as “moderately affordable headphone set”. Logitech’s G230 features premium-quality 40mm neodymium drivers that deliver superb sound emissions. The earpads were constructed with sports performance-cloth materials which feel exquisitely comfortable. What’s more, they’re very easy to clean as they can slip off very easily. Though bulky at first sight, the G230 headphone set boasts a lightweight design. The earpieces are slim and very light, which means that you won’t have to worry about that cumbersome feel certain models produce after several hours of usage (inner ear pain, heat buildup, and such). The noise-canceling microphone is, perhaps, the best feature of the G230 – it folds rather easily and allows you to keep in touch with your teammates in the simplest way possible. Furthermore, the onboard controls allow you to mute your music or switch the volume in an easier way when compared to doing it manually (on the speakers). In essence, Logitech’s G430 is an improvement of the G230. It features a similar design, only improved in terms of overall performance (with the addition of Dolby 7.1 surround support) and other important aspects of value. One of the most notable differences between the G230 and G430 can be seen in the immersive capabilities of this model. The lightweight design, noise-canceling microphone, and onboard controls are the features which both G230 and G430 have, so we’ll talk about the new additions. First of all, the Logitech G430 supports Dolby Digital Surround System modes, as well as DTS Headphone X. This will allow you to experience sounds and immerse yourself in your world (music or gaming) on a level you never thought existed. Note that you’ll need the latest versions of the Logitech Gaming Software though. While the G230 features lay-flat earpieces (can rotate up to ninety degrees), the G430 has a set of rotating ear cups – the only difference can be seen in the words the brand used to describe them, as even the latter can swivel only up to 90 degrees. However, the newer version (G230) was improved in terms of fit and comfort. Both G230 and G430 come with neodymium drivers, a noise-canceling microphone, and feature sound isolation and passive reduction. That leads us to the conclusion that both models are remarkable in terms of sound quality. However, the fact that G430 supports Dolby surround system means that this round goes to Logitech G430. Features of Logitech headphones are always top notch – G230 and G430 aren’t an exception. However, this round is a draw, as the differences between the features of these two headphone sets are so small that they’re negligible. Surprisingly enough, Logitech G230 and G430 share the same frequency values and perform exactly the same in this field. The lowest frequency is 20Hz and the highest 20 kHz, these two are, again, equal in this field of performance. It’s only normal that an upgraded version will cost more than its predecessor – such is the case here. Let’s be sure on one point, though – both G230 and G430 are valuable for the cash, G430 is nearly twice as expensive as the G230. PROS: Very affordable / High-quality features / On-board volume controls / Soft pads and lightweight construction / Excellent sound quality. PROS: Amazing sound quality / Great build material / Lightweight and sleek design / Excels in numerous fields of performance. CONS: Doesn’t support Dolby surround system / Inferior inner pads. CONS: Costs nearly twice as much as its predecessor / The improved model features only a handful of new features. 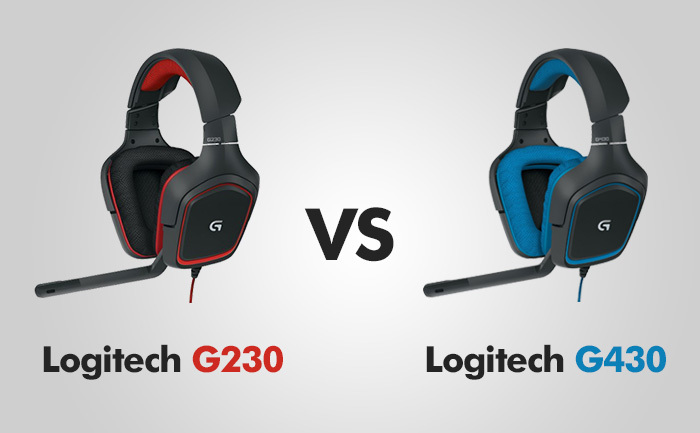 We’ve just confirmed what we thought at the very beginning – Logitech’s G430 is better than G230, but can we say that it holds a higher value for the cash with a clear conscience? Basically, the improvements are noticeable, but all are minor except the Dolby surround system compatibility. So, if you’re asking “is G430 worth the cash?”, the answer would be yes, although you’d be content with G230 as well.